Help working parents succeed at work and home. Here's a fresh look at the difficult job of balancing work and family. Help working parents succeed at work and at home by sharing this collection of practical information and tools. Workplace topics include tips on organization, productivity and family leave. Home tips cover maintaining family relationships, finding child care, family meetings and other day-to-day survival strategies. 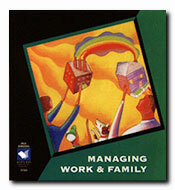 Balancing issues such as stress and guilt are included, as are pages for those managing employees with families. Choosing Child Care: What Are Your Options?